Introductory article on this versatile add-on, that allows me to generate list of content in many types: from sliding images and tags-cloud in frontpage, to menu and lists of articles in other pages. Today I will describe some basic features and in the next tutorials I will show you how I implemented it in this site from time to time. At the beginning I have installed the Views and Views Slideshow modules only for the sliding images effect in the front page. Then I have extend it to building dynamic pages and blocks, teaching it properly. In fact the Views module allows you to easily specify the criteria for displaying a subset of content, even combining multiple content types. As new content is added to your web site, the resulting View is dynamically updated to reflect the new content. The name Views comes from database terminology and they work in a similar manner but they let you use a graphical user interface to create the database query. 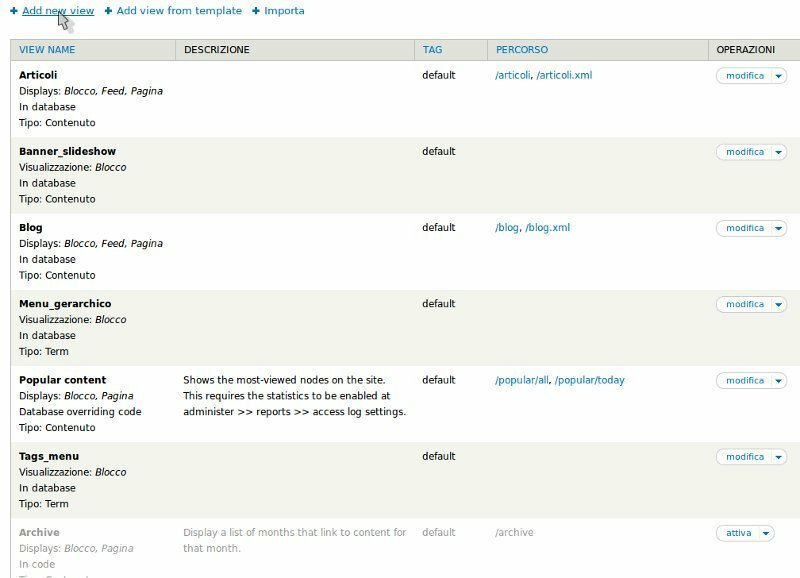 When you create a Drupal View, the module writes the queries for you so you don’t have to know anything about database administration. The Views module was created and maintained by Earl Miles (merlinofchaos on drupal.org). All downloadable versions and documentation can be found here. This tool is essentially a smart query builder that, given enough configuration, can build the proper query, execute it, and display the results.